(2105, Oklahoma Historical Society Photograph Collection, OHS). Southwestern Oklahoma State University held its centennial celebration on March 8, 2001. Southwestern Normal School was established by the Oklahoma Territorial Legislature on March 8, 1901, to prepare teachers for the public schools. Several towns waged vigorous campaigns to become the site of the new institution. After a lengthy court battle, Weatherford was chosen as the school's home. Work began on the first building, located on a hilltop overlooking the frontier town. While the first building was still under construction, classes began on September 15, 1903. Attending classes in the three abandoned saloons on Main Street, students could hear the clink of glasses and the voices of gamblers in the adjoining saloons. Pres. James R. Campbell and twelve faculty members welcomed 113 students to the new school. 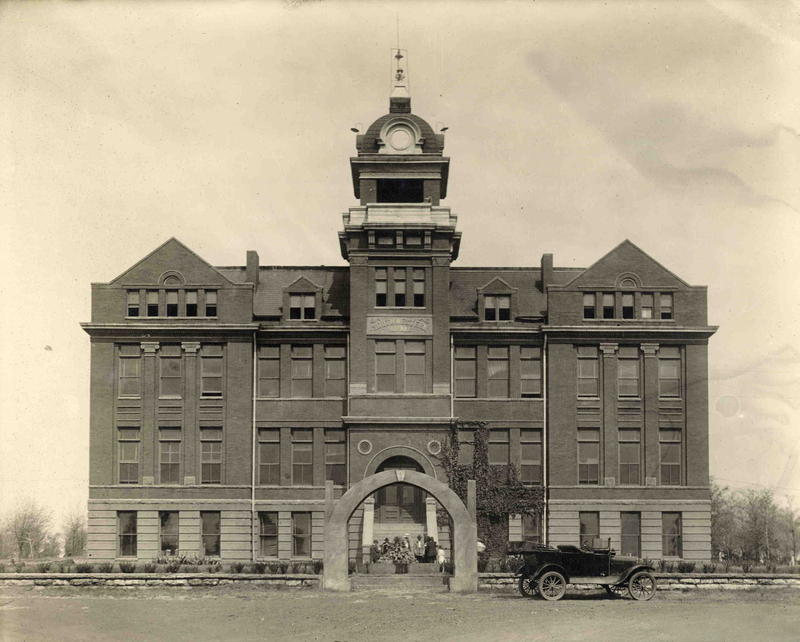 In 1920 Southwestern Normal School became a four-year institution under the name Southwestern State Teachers College. In the 1930s Southwestern struggled to survive attempts to close the school for financial reasons and to remove several presidents for political reasons. In 1939 the Board of Regents added a vocational curriculum to the teacher training mission, leading to the establishment of the Pharmacy Department, now the School of Pharmacy, a nationally known program. Southwestern grew rapidly, adding new degree programs and graduate programs after World War II when returning veterans took advantage of the GI Bill. Under the leadership of Pres. Al Harris in the 1960s and 1970s, Southwestern added several new buildings and reached a record enrollment of over 5,500. In 1974 the institution's name was changed to Southwestern Oklahoma State University. Southwestern has gained national recognition through sports and academic programs. With a student enrollment of 4,915, the school entered its centennial year and the twenty-first century under the leadership of Pres. Joe Anna Hibler. She was the second woman (Kate Galt Zaneis was the first) to serve as president of an Oklahoma institution of higher education. Jerry G. Nye, Southwestern Oklahoma State University: The First 100 Years (Weatherford, Okla.: Southwestern Oklahoma State University, 2001). Jerry G. Nye, "Southwestern Oklahoma State University," The Encyclopedia of Oklahoma History and Culture, https://www.okhistory.org/publications/enc/entry.php?entry=SO020.